Why choose an invisible undershirt? It gives your outfit a cleaner look because the contours of your undershirt are not visible through your shirt. You feel fresher during the day. The undershirt catches perspiration that would otherwise get into your shirt. This keeps your clothes fresh for longer. What do you watch out for when buying invisible undershirts? The choice of specific invisible undershirts depends on your style. Match the neckline to the neckline of the type of clothes that you like to wear. This is likely to be different for sweaters than for shirts. Don't forget to match the colors, too. In addition, it is important to ask yourself whether you prefer to wear a fitted or loose fitting T-shirt under your clothes. A good fit is important if you want to feel comfortable in your outfit. Men often choose an undershirt that fits well, like a slim-fit undershirt. An undershirt with a slim fit often does not only look invisible under your shirt but it will also feel invisible. There are men who don't like a perfectly fitting T-shirt and prefer to wear an undershirt that fits loosely around the body. In that case you can opt for one of our loose fit T-shirts. The neckline of an undershirt is also important if you want your undershirt to be invisible under your clothing. Do you wear an outfit with a tie? The neckline of your undershirt is guaranteed to be invisible. In that case, you can choose a T-shirt with a round neck. Do you like to undo the top button of your shirt but do you want the undershirt to be invisible? It is best to choose a Johnson, a T-shirt with a regular V-neck. Do you like to wear your shirt with an extra button undone but don't want the undershirt to show? 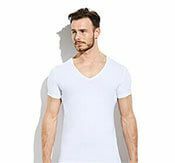 Choose a T-shirt with a deep V-neck. If you want to be sure that your undershirt is invisible under your white or light-colored shirt, go for our invisible khaki T-shirts. 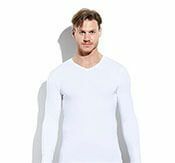 The color and neckline of these undershirts are specially designed not to stand out. 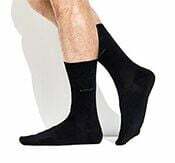 When you wear a lot of dark clothing, it is not unwise to purchase the black undershirts from Bamigo. Which invisible undershirt fits your clothing style? 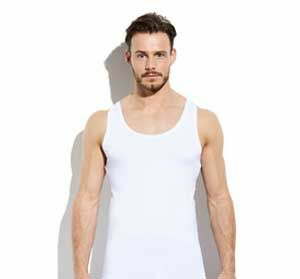 Bamigo offers a diverse range of undershirts that mainly differ in fit, neckline and color.